Monday, April 15, 2019 by: Isabelle Z. (Natural News) There is no question that drinking too much alcohol is bad for your health, but if you avoid it entirely, you could be missing out on some potential health benefits. You’ve probably seen plenty of headlines about the antioxidants in red wine, but if you’ve been looking for an excuse to drink more beer, researchers from the University of California, Davis, have some good news for you: Beer may help to prevent osteoporosis. Silicon is found in beer in a soluble form known as orthosilicic acid. It boasts a high bioavailability – roughly 50 percent – which makes it a major contributor to the silicon intake of the Western diet. 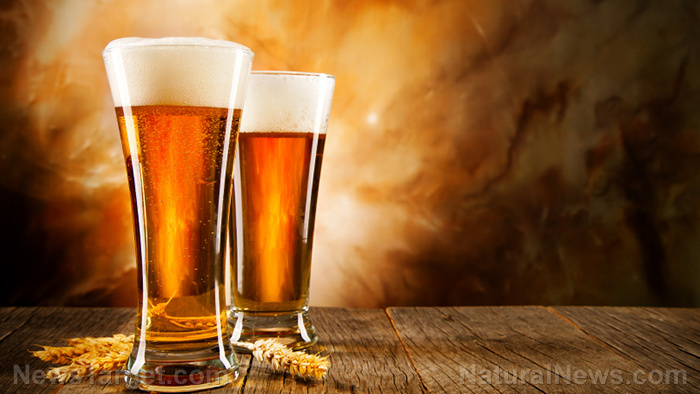 Soluble orthosilicic acid is useful for the development and growth of bones and connective tissue, prompting researchers to conclude that moderate beer consumption could help to fight osteoporosis, which is characterized by the deterioration of bone tissue and low bone mass. When it comes to different types of beer, the researchers looked at a range of raw material samples and discovered that the silicon content of barley does not change much during the malting process as most of it resides in the husk. Nevertheless, they found that the malts that boast the highest silicon content are the paler ones, which undergo less heat stress during malting. Darker products that use significant roasting, like roasted barley, black malt and chocolate have far lower silicon contents than other malts. Meanwhile, the samples of hops they looked at had very high silicon levels – sometimes four times the amount of silicon found in malt – although it’s important to keep in mind that hops are used in smaller quantities than grain. The researchers believe that highly hopped beers would therefore contain higher levels of silicons. A study carried out by the National Osteoporosis Risk Assessment has reached a similar finding. That study looked at 200,000 post-menopausal women over the course of two years plus a year-long follow-up, keeping tabs on their alcohol consumption and bone mineral density scores. The scores are based on peripheral bone densitometry on the participants’ finger, forearm or heel. They also used questionnaires to explore risk factors for low bone mineral density. The researchers discovered two lifestyle factors that could reduce osteoporosis risk. Not surprisingly, one of these was exercise. The other was moderate alcohol consumption, especially beer because the hops in beer contains flavonoids that are believed to serve as a natural hormone balancer. They also found two factors that can raise your osteoporosis risk: smoking and using cortisone. If you want to drink beer for health benefits, be sure you’re choosing pale ale – but don’t overdo it. A recent study from Oxford University that involved more than 13,000 people aged 40 to 72 found that drinking more than a third of a pint of beer per day, or one unit, can reduce your cognitive function. You also need to consider the potential damage to your liver that can be caused by excessive drinking. If you enjoy drinking beer or wine, be sure to stay on top of the latest research to ensure you’re consuming it in a healthy way.